There haven’t been many times this season when Rangers have gone into a game to face a team who are on a better winning run than they are, but on Saturday, they host Peterhead, a side whose five consecutive wins puts them top of the Division 3 form table. And, following a hugely controversial week in Scottish football, there is everything to play for at the top of the league once again. Proposed reconstruction plans, which included an 18-team bottom tier, would have rendered the Division Three promotion race meaningless, but the breakdown of talks on Monday means that next season will continue the status quo in the Scottish Football League and Peterhead are right back in with a shout of playing in Division 2 come kick-off time in August. The Blue Toon’s recent surge has propelled them above Queen’s Park and into second place in the table with just three games remaining, and three points at Ibrox could guarantee them a play-off spot if other results go their way. All this conspires to create a tricky tie for Rangers, who remain determined to leave Division 3 in a blaze of glory following an underwhelming season, but who will need to stay on top form if they are to halt Peterhead’s excellent run. The Gers are unbeaten in five games themselves but that run includes two draws, against Montrose and Stirling. Nevertheless, the Ibrox side remain huge favourites to triumph on Saturday, priced at 1/4 in the 3-way betting market. New customers who sign up with bwin online qualify for a free £20 bet and using that to back Rangers to beat Peterhead will return £25 if successful. 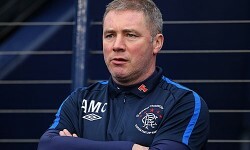 Peterhead held Ally McCoist’s men to a draw on the opening day of the season at Balmoor Stadium and are 17/4 to repeat the trick at Ibrox, while they are 29/4 to grab a crucial but unlikely three points.